I have a Dominion set that includes the base set plus Alchemy and Prosperity. The box contains a plastic insert with many slots of various sizes. I have stored the cards in alphabetical order mixing the three sets together, but this seems suboptimal. 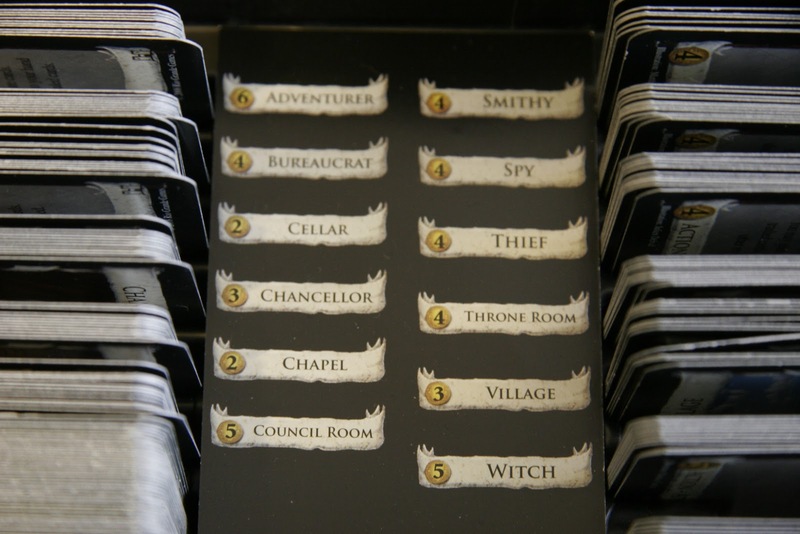 This probably has a really obvious answer, but is there a way to organize the cards so the plastic insert makes sense? Any recommendations? If you put it down the right way, each card's name will sit directly beside a card slot. This organiser card will tell you which slot to put each card in. The thicker slots (e.g. the money slots) will have more corresponding spacing on the organiser card, so make sure those line up. This organiser card also means I can check very easily where cards are: I can just look at the organiser, search for the name I'm after, and pull the cards out of the corresponding slot, which beats having to pull various piles out one by one trying to hunt for the right one. In the first photo, I can tell the Adventurer was put in that top left slot, the Bureaucrat beneath it, Cellar beneath that, etc. The first thing I would do is leave out the Alchemy set. Beyond that I personally prefer alphabetical for the straightforward reason that it takes less time to dig out cards when you're setting up, and given that (after Possession) setup is the most annoying thing about playing Dominion this is pretty important. I would assume that they would be alphabetical in each set, with the resource and victory cards obviously belonging in the biggest slots. Not the answer you're looking for? Browse other questions tagged dominion dominion-prosperity storage dominion-alchemy or ask your own question. How can I beat “Big Money” in Dominion? 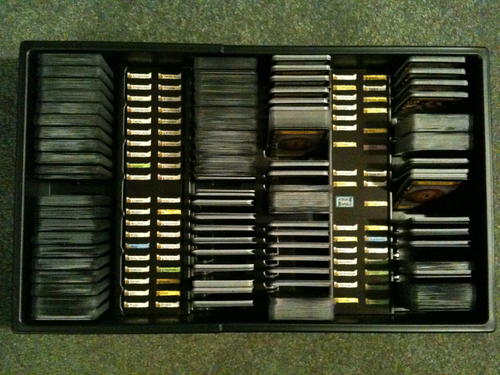 Can I use sleeve protectors for Dominion cards and still fit them back into the box? How does the addition of the Potion treasure from Dominion: Alchemy change the game? Does mixing Dominion expansions lessen the power of card combinations in random kingdom setups? What do I use the curse and coin randomizer cards for? How thick are Dominion cards?